Isn't it true that you get zapped by annoying shocks of static electricity several times a day? You are not alone! Most people experience these unpleasant electrical shocks. Static electricity is always present, ANTI-SHOC being useful at all times. 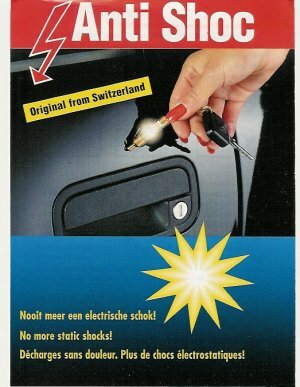 ANTI-SHOC eliminates annoying shocks caused by static electicity. 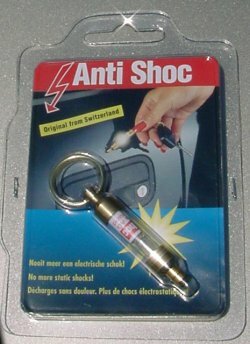 ANTI-SHOC is Swiss made and does not require batteries. It will never wear out. 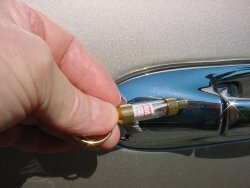 Application: Simply press ANTI-SHOC to any metal object to painlessly remove static electricity. The light inside will instantly show you that you are static free. Material: The front and back parts are made of brass.